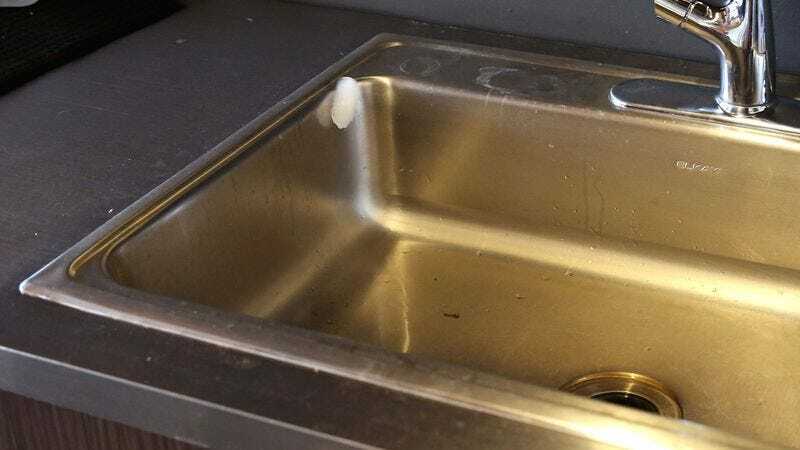 CHICAGO—Noting how it glided effortlessly over the stainless-steel surface, sources reported Wednesday that an ice cube that had been tossed into the sink at McDouglas Marketing Associates was flying up the side of the basin like a skateboarder shredding the half-pipe at an extreme sports exhibition. Eyewitnesses told reporters that the cube of frozen water dropped into the sink at a steep angle as if it were a professional skater at a Southern California skate park building momentum in preparation for performing an alley-oop frontside heelflip or boneless 540. The ice cube was then said to have launched upward from the lip of the fixture in a manner similar to skateboarding legend Tony Hawk gliding into the air from the edge of a vert ramp, reaching an impressive height above the sink as several McDouglas employees on their lunch break looked on like a cheering, sold-out crowd. Reports indicated that the ice cube appeared to effortlessly hang in the air, suspended for an impossibly long time while spinning swiftly—conjuring images of “The Birdman” himself making history by executing the first-ever 900 at the 1999 X Games—before making its descent back into the kitchen sink. At press time, those present confirmed that the cube had totally botched the landing, shattering like skater Sean Malto’s ankle when he ate it during the 2014 Dew Tour.